Say Nothing, Act Casual: Time is flying. I am flapping. Things are getting easier. Sort of. And harder. New stuff is happening and changing, inside their heads and inside mine. They text me. If I'm out and they're home. Sarah knows her library day and does her own hair (mostly). She is beginning to read Judy Blume books. When she gets into my lap for a proper cuddle (as she badly needed this morning), she's so long she overflows all over the place. Josh is appalled because he has to be in the Easter hat parade. It's just Kindy to Year 2 kids so Sarah is out. Issy is beside herself with excitement about her first foray into the world of Easter hats, but Josh says he's too old. He thought so last year too, but this year he's really adamant he's not doing it. I told him I'd buy him a cool black sombrero. I told him he'd be able to make something really cool. And manly. He's not convinced. As far as I know, if you're in K-2, participation in the parade is compulsory. And I'll be there to watch him. Because it's Grandparents Day and I'm the token Grandparent. Now with three classrooms to visit in 30 minutes. I remember Sarah's first Easter parade. She was so proud. With eggs dangling from her straw hat like corks on a swagman's. She's not cynical. There she is. So totally cute. She fit in my lap back then too. Josh is starting to let my hand go as we approach the school. He sort of rubs his head on me instead. Issy goes off on playdates to her new school friends houses. I don't know them terribly well yet and I'm worried she's not an easygoing guest. That she continually asks for food, and says annoying things like 'the guest should get the best' (which is our rule at home but may not be other people's). 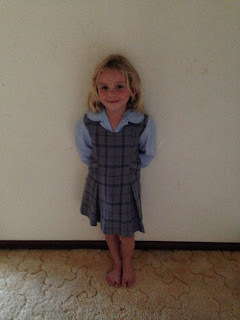 She is too small for Sarah's old winter school uniforms. So I've given Sarah's away and called in the size 4 and 5s from a kind friend. Check out the size 4. Small in body but her mind has teenager qualities already. The passing of time is inevitable and uncontrollable. But I'm struggling. Each day is a battle to get through what must be done. Each week is a series of goals and deadlines and obligations. Right now, there's no stopping, no rose smelling. It's fun, it's positive and constructive, but time is passing too quickly. I feel like I'm missing my own kids, even though I'm with them every day. At least, on Thursday, we're spending all day in the car together. That should get me over any foolish sentimentality.